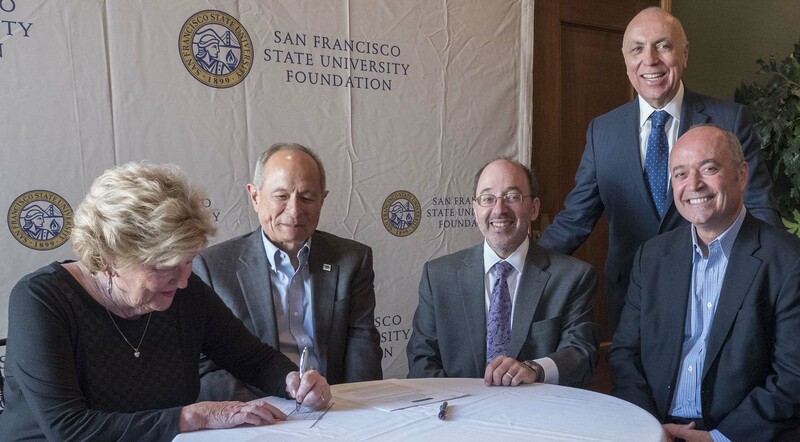 On November 26th, 2018, San Francisco State University President Leslie Wong announced a $25 million gift from alumni George (B.A., ’65) and Judy Otten Marcus (B.A., ’62) as part of the University’s BOLD Thinking campaign. 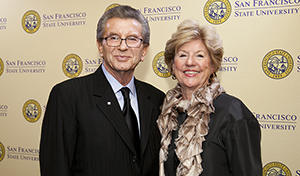 The newly established George and Judy Marcus Funds for Excellence in the Liberal Arts, in combination with the Marcus’ recent $1.8 million donation to SF State Athletics Scholarships, comprise the largest gift in the University’s history. The Marcuses’ donation has propelled the campaign to a major milestone, with over $134 million (90% of goal) raised to support University students, facilities, faculty, and programs. After they started dating while undergraduates at San Francisco State University, George Marcus and Judie Otten Marcus fell in love and married, raising four children from their home in Los Altos Hills. Always community-focused, they became Bay Area luminaries, forging unique paths in business, community leadership, and philanthropy. George Marcus’s bold thinking has manifested in his professional life as well as in philanthropy. His family migrated from Greece when he was a child, and like over 37% of SF State’s student body, his was the first generation in his family to graduate from college. Armed with a bachelor’s degree in economics, which he completed in 2 ½ years, he founded Marcus and Millichap in 1971, a real estate development, investment, and brokerage firm that now has offices in 39 states. According to a 2011 Profile of Mr. Marcus in Palo Alto Online, his business success has been largely due to his iconoclastic approach and his energy, vision and drive. With six schools, 15 departments, 11 centers and institutes, and one of the most diverse campuses in the U.S., SF State’s College of Liberal and Creative Arts (CLCA) is a progressive force for creativity, intellectual thought, and cultural change. The College’s commitment to the liberal arts drew the Marcuses to invest in its programs. The George and Judy Marcus Funds for Excellence in the Liberal Arts will endow two new faculty chairs in the college’s Creative Writing Department and two in the School of Cinema. The Funds will also support renewed facilities and faculty and student research in the college through the George and Judy Marcus Awards for Faculty and Student Research. San Francisco State University’s Creative Writing and Cinema programs are already ranked as some of the finest in the country, and have graduated and employ many distinguished and award-winning authors and filmmakers. Both programs are known for supporting student experimentation and career readiness, and for having a deep connection with the University’s ethos of social equity and inclusion.